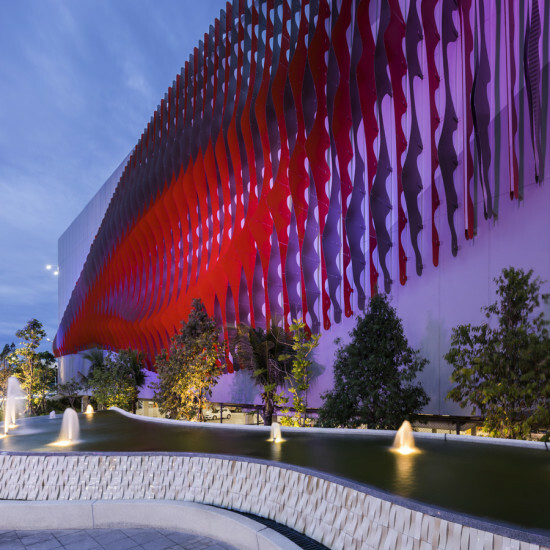 Inspired by lenticular effects and moire patterns, Synthesis Design has produced an engaging facade installation on a large commercial shopping center at Central Plaza Rayong. The system incorporates CNC-milled aluminum composite “fins,” with custom attachment details to produce two “fields” of surfaces that ripple along a precast concrete facade. Color applied to one side of the fins differentiates the to fields from one another. “This is something we’ve been interested in awhile: lenticular effects – visual effects dependent upon view orientation. We are interested in trying to increase the level of visual interactivity through the way people engage the project.” says Alvin Huang, founder of Synthesis Design. To achieve this, Huang and his team leveraged geometry from iterative digital study models. Utilizing scripts built in Grasshopper for Rhino, the team developed a series of surfaces defined by attractor curves that create ripples. Then, through a strategy of mirroring, a secondary field is created, utilizing off-cuts of the first field. The process results in two sets of seemingly unique undulating profiles that nest into one another. Products Aluminum composite material by ALPOLIC Materials of Mitsubishi Plastics Composites America, Inc. The facade and roof serve as a the graphic identity for the 20,000 sq. ft. building while acting as a veil which reveals and conceals views. 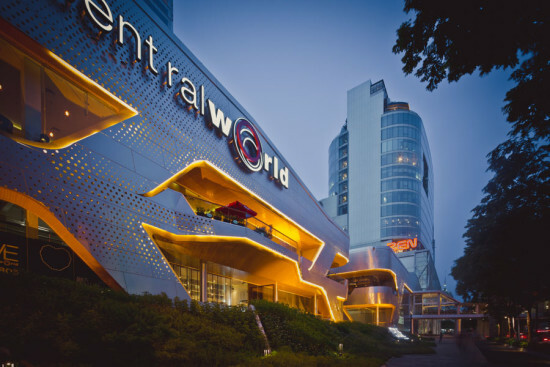 The Groove provides an extension to CentralWorld, the third largest mall in the world. At 6,000,000 sq. ft., the mall is comprised of three towers: an office tower, a lifestyle tower (including a gym, dentist and doctors offices, schools, etc. ), and a hotel tower. The main shopping center includes four department stores and a convention center. Sited at an existing entry plaza to the office tower, which feeds an underground parking garage, the project came to Synthesis’ office with several structural design constraints. The weight of the addition was limited, causing the design team to incorporate a specific steel frame with a grid coordinated to the bay spacing of the parking garage immediately below grade. Alvin Huang, Founder and Design Principal of Synthesis Design, says this helped save time at the start of the design process. At 20,000 sq. ft., the project, jokes Huang, is “the punctuation on the paragraph.” The design team approached the project with a concept aimed at providing an intermediary space – an “intimate atmosphere” – within Bangkok’s predominant shopping district. Their strategy was to depart from a traditional single monolithic building (more of the same), developing instead an indoor/outdoor atrium space to link a series of buildings inspired by the Bangkok "soi" (Thai for side-streets) for their comfortable café-like pedestrian atmosphere. The building envelope of the Groove peels open to organically reveal openings rather than incorporating typical punched openings. An aluminum composite panel rainscreen system incorporates gradient patterning and integrated lighting to produce an exterior that is “intense, active, and slick” according to Huang. “The skin replicates the intensity of a specular effect of continually pulsating lights along Ponchet Road.” A warm interior spills out to the exterior via CNC-milled timber soffits, whose geometry peels outward, overlapping openings as a sort of exaggerated detailing found in an airplane window trim. The rainscreen panels were CNC milled by a local fabricator who utilized geometry from Huang’s office to produce a custom perforation pattern. “We didn’t want the architecture and the identity to be two different things,” says Huang. “The signage appears and disappears – a gradient that pulses and draws your eye toward openings.” Huang says as an office, Synthesis is generally interested in the relationship between the digital and the hand made. “We are highly digital in our design process. but in Thailand, most construction components are hand made and ultimately assembled by a labor force of limited experience, requiring simplification, not complexity.” Synthesis’ design office focuses on "digital craft" with a body of work that is driven by the relationship between fabrication and the act of making as part of the design process, says Huang. “What we are not interested in is designing, and then figuring out how you are going to make it.” The Groove is one of 37 projects currently nominated for "Building of the Year 2015," a poll open to the public through the end of January, 2016. Durotaxis rocker features gradient mesh informed by function, ergonomics, and aesthetics. For Synthesis Design + Architecture founding principal Alvin Huang, there is a lot to love about 3D printing. But he does not always like how the technology is applied. "I see it all the time—a lot of students just 3D print everything," said Huang, who also teaches at the USC School of Architecture. "You see things that could have been done better, faster, or cleaner by hand. I find it a very troublesome predicament we're in, we're letting the tool dictate." When Stratasys contacted Synthesis about designing a piece for their Objet500 Connex3 printer, the architects decided to turn the relationship between human and machine on its head. Instead of asking how they could implement a preconceived design using the Objet printer, they challenged themselves to create something that could only be manufactured using this particular tool. Durotaxis Chair, a prototype of which debuted at the ACADIA 2014 conference, showcases Objet's multi-material 3D printing capabilities with a gradient mesh that visually communicates the rocker's function and ergonomics. Though Synthesis designed the Durotaxis Chair almost entirely in the digital realm, said Huang, "we see the computer very much as an intuitive tool, the same way previous generations thought of the pencil. We try to find a happy medium between the scientific aspect, and the intuitive manipulation of that science." The architects bounced among multiple software programs including Rhino, Grasshopper, Weaverbird, ZBrush, and Maya to craft a form that operates in two positions: upright, as a traditional rocking chair, and horizontally, as a lounger. The chair's structure comprises an interwoven mesh of two materials, one rigid, opaque, and cyan in color, the other flexible, translucent, and white. While the resultant gradients reflect both the physics and ergonomics of the chair, they also deliver an intended aesthetic effect, creating a moiré pattern that encourages the observer to move around the chair. "It wasn't the case of the code creating the form," explained Huang. "We very clearly sculpted it for visual and ergonomic properties." Stratasys manufactured the half-scale prototype at their headquarters in Israel. Unlike a typical 3D printer, which has one head with one nozzle, the Object contains two heads with 96 nozzles each. Using proprietary substances the company calls "digital material," said Huang, "you can print a matrix of gradients between those two heads. In our case, we were able to create gradients not just of color, but also stiffness and transparency." Synthesis remained in constant touch with the Stratasys team throughout fabrication, fine-tuning the design as problems arose. "It was also an experimental process for them," said Huang. "Ultimately, through a lot of back and forth, we were able to arrive at something they were able to print." Synthesis is now tweaking their design for a full-scale version of Durotaxis Chair. The principal challenge they encountered while fabricating the prototype, explained Huang, was an excess of support mesh. "It's still a big manual process. You have to remove all of the support material." The updated design will take advantage of the team's finding that, by printing vertically up to a certain angle, they can eliminate the need for support mesh. "We're trying to take it a step further," said Huang. "How do we expedite the process, and refine the geometry of the lattice so that you're changing direction before the material starts to droop? We're trying to do something where, in a sense, we're growing the chair." Despite his discontent with the way some young practitioners approach 3D printing, Huang thinks that the technology holds great promise, especially in the world of architecture. 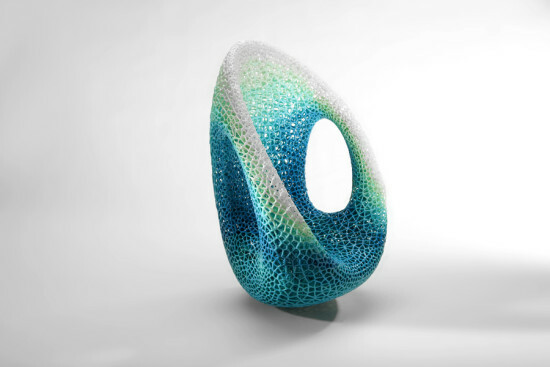 He points to some of his contemporaries, like fellow Angeleno and architect/jewelry designer Jenny Wu, who is taking 3D printing in exciting new directions. "When you think about architecture and design, most of what we do is the assembly of products, and the more bespoke you can make them, the better," said Huang. 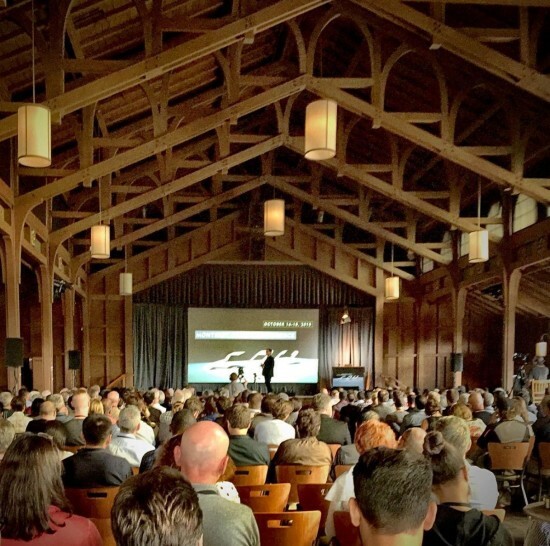 "I look at 3D printing as a shift from rapid prototyping to rapid manufacturing. Hopefully someday we can produce bespoke items for the same impact as mass-produced items—that is the theoretical holy grail." 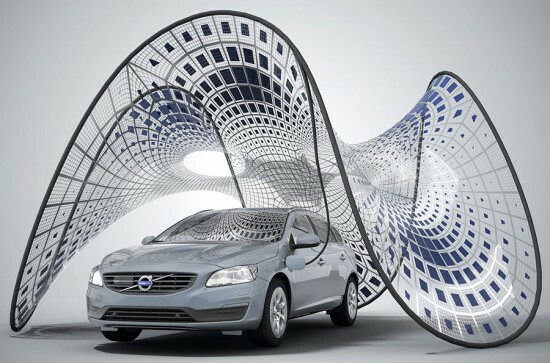 Los Angeles-based firm Synthesis Design + Architecture (SDA) has won the "Switch to Pure Volvo" competition to design a portable pavilion showing off the Swedish car company's V60 plug-in electric hybrid. The 13-foot-tall, 16-foot-wide project's sinuous form is composed of a moiré-patterned, vinyl-coated polyster fabric imbedded with flexible photovoltaic panels tensioned over CNC-bent aluminum rods. The display's three sections echo the three modes of the car—hybrid, gas, and all-electric—and its curving form is also practical—its torqued compression between frame and skin enables the structure to stand without any extra support. The bendy solar panels will power the car while it's on display, and the whole installation can be broken down into small parts for transport. The fabric gets folded up and the aluminum tubes shrink down like tent poles. The first stop is Rome this September, then Milan, and SDA principal Alvin Huang said Volvo is considering traveling the display worldwide. The idea of a movable power source could really catch on, said Huang, especially if such structures can be broken down into small parts. "With electric cars you now have to go to a power source instead of you bringing your own power source," said Huang. Maybe that's beginning to change?